Will Magic Mountain focus more on flat rides? 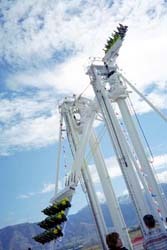 Re: Will Magic Mountain focus more on flat rides? I hope they make some flippin dark rides! Better yet, keep their rides and just give them some theme and make the queue's go into some rooms or something. Also make Batman indoors. That'd be AMAZING. Meh... I don't know if I would be excited for a Six Flags dark ride; if it were Disney or Universal heck yeah I'd be excited...maybe a Scooby-Doo interactive dark ride would suffice though. What I would want to see is a Sky-Swatter ride. Coasters are great but I'd like to see some more flat rides. I'm still bummed to this day that Freefall and Spin-Out got eliminated. FYI, Six Flags already does have some dark rides. I've ridden all of them and all are great. I think there are more than those, but those are the ones I have ridden. As for what Magic Mountain needs, they do need more flat rides. As it stand now, they only have what, 4? The Buccaneer, Swashbuckler, Atom Smasher and Grinder Gearworks. All are AT LEAST 25 years old. A few 'modern" flat rides would go great at the park, at least IMO. I'm still holding out hope that they will get Maliboomer when it leaves DCA. ^Actually, Magic Mountain already used to have an Enterprise. It was located to the left of the entrance of Batman, somewhat behind the Corn on the Cob booth. You can still sort of tell a circular flat ride was there. It was removed some time ago. And while a few SF parks do have a dark ride, I doubt SFMM would ever get one for the same reason Knott's will probably never get one again either: it would draw too many direct comparisons to Disney. As far as flat ride requests go, I would love to see a Huss Frisbee. It's so much superior to the Chance model operating at Knott's. They could also use an Intamin drop tower pretty badly, too. A roto tower would be good. Triokas are always fun, too, and pretty family friendly. And if you want an Enterprise style ride, let's go for the Huss Fly A Way... those are amazing! Anybody here asking for a Skyswatter, have you actually ridden one? Are they really bad? I'm surprised because they look cool. Six Flags does not have its own dedicated team of designers such as Walt Disney Imagineering or Universal Creative, but they do hire others firms who are capable of delivering. You have it backwards. Monster Mansion is the current name, Monster Plantation was the old name. It was part of a slightly broader effort to remove "offensive" references, which included renaming the Confederate section to Peachtree Square. I have ridden a SkySwatter (at Thorpe Park), and actually found it very enjoyable. The biggest problem with the ride that I had... slow ride cycles. The line takes forever. That's right ... Still a great ride either way. I loved the Enterprise that used to be at SFMM (Reactor it was called I believe). As for the Sky Swat ... I wanted to ride the one at Astroworld when we were there but it didn't open that day. Heck, I loved the Enterprise when it was back at Knott's as the Loop Trainer. The old stereotypes in that area and that ride were so old and bad that they were funny. Generally, if well chosen, flat rides help absorb some of the crowds, and allow you to get a thrill with a much shorter wait. And while coasters are great, there's nothing like a good spin and barf. Six Flags Magic Mountain needs dark rides and better queues. I live next door to the theme park and it reaches over 105 degrees here in the summer. Put some of the queues indoors and makes the guests comfortable. There is only a couple of places to even get out of the heat in the whole park, and most of those are in the arcades. In indoor Batman ride would be a perfect addition. The ride is small enough to do this. The reason why flat rides have short lines is because guests are not interested in them. Build more rides that people want to go on. The "spin and barf" problem is another reason to see them go extinct.